Beautifully engraved certificate from the Globe Shipbuilding and Dry Dock Company of Maryland issued in 1920. This historic document has an ornate border around it with the company's name on top. This item has the signatures of the Company's President, B. C. Cooke and Secretary and is over 86 years old. 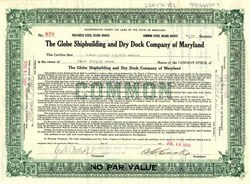 Globe Shipbuilding Company of Baltimore was later known as the Maryland Drydock Company.